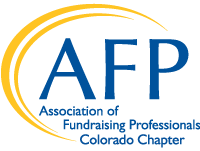 The AFP fall conference Rocky Mountain Philanthropy Institute will be Thursday, September 13 - Friday, September 14, 2018 in Breckenridge. Mark your calendar now so you won’t miss this excellent and affordable opportunity to get the contacts and tools you need to tackle your fundraising goals. We are thrilled to announce our keynote speaker, Kishshana Palmer! She is a sought after strategist, speaker, trainer and coach who combines “book smarts” with real-world expertise and pop-culture savvy to create the unforgettable cocktail she calls Fabulously Fundraising. You’re gonna love her! Stay tuned for RMPI registration information, as well as sponsorship and speaking opportunities. We’re looking for some fabulous speakers who will present interactive workshops for those who attend RMPI. Topics submitted must be applicable to an audience of Fundraising Professionals, whether it be beginner, intermediate, or advanced. Click here to complete the application. All submissions must be received by March 30th at 5pm! Beaver Run has reserved a limited number of rooms for RMPI attendees at a great conference rate! The number of rooms is limited. Cancellation Policy: Deadline for all event changes and cancellations will be early August After that date, no refunds will be made.